If you like Quality products, you will like Hammond tube organs. They are made with the clear intention to work failure free as best as they can. Originally intended as church organs, the Hammond company become more when they began to market those into the much larger home market. Many famous (often black) musicians really get out of this instrument what is in it. Look at this video of Booker T. Jones. He explains how he discovered the Hammond, and the song GREEN ONION (you will recognise it) he composed on and for the Hammond when he was 17. Also the sound of Santana depends on the Hammond very much. So that kind of music made me want to own a Hammond for myself. From 1990 to 1996, I was a member of the German Hammond Nostalgie Club, which have the intention to restore Hammond tube organs. Though transistor organs are in the collection of many, and there was for instance support there for my B3000. The late Dieter Enners who started the club, was always a friend and personal help to me, and he learned me to pay attention to modify things back to original if needed, but at the same time kick out parts with problems, such as a detoriated horn driver. He was very busy, and some day a woman took over the administrative part from him. She ended my membership, without a single warning, when I forgot to pay membership in time. Well, there are a few ways to get rid of members, and this is sure a good one. At that time, Barbara Dennerlein had an honor member ship, same as the late Wild Bill Davis, who played once in our club, and I own a 78rmp record of him. Barbara Dennerlein s is amongst the best of today's organ players, you can see here on TV even, but she plays too nervous and too perfect for my personal taste. Like too mechanical. Don't know how to express this. But this is a matter of taste of course. Look for Wild Bill Davis in youtube. His way to play chords with 10 or 12 keys at a time, and then move through the scales is for me the best to hear. Though It's full of mistakes, it sounds so great. Here is an amazing recording of an unknown artist, playing Superstition by Stevie Wonder, in an organ shop. He seems to play in in E-flat, (E♭) which probably makes the chords come out easier for his right hand, as the chords seem to use a lot of black keys. Playing in E-flat makes it also easier for the feet party, to hit the E♭ pedal because it's easy to find. Look at that. He doesn't even play that difficult, but he is doing it really good! This is a good demondtration of how a B3 can sound. He plays a C3 which doesn't look as nice a B3, but it has the same hardware and the same sound. 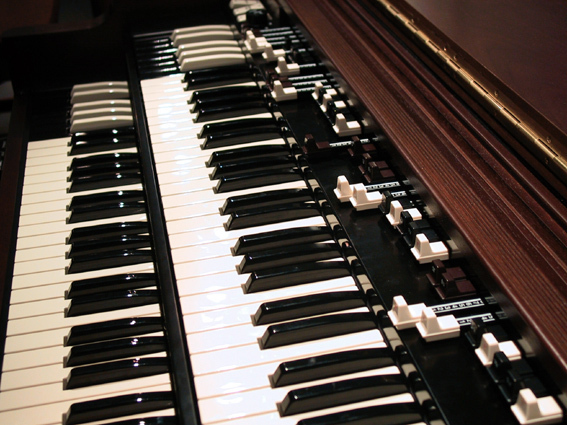 The Hammond B3 is a 1950's organ, with mechanical tone generators (so called tone wheels). 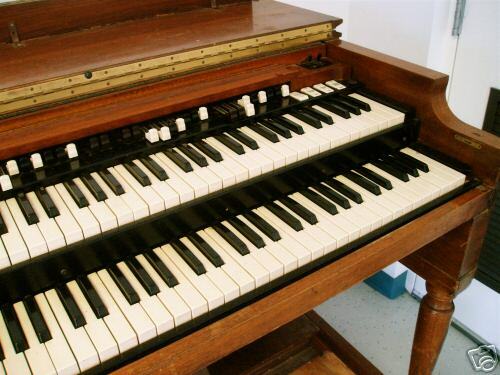 Some people think this was a Hammond invention, but the inventor of the tone wheels organ is actually a man called Charles–Emile Hugoniot, who patented the tone wheel generator build 1919. 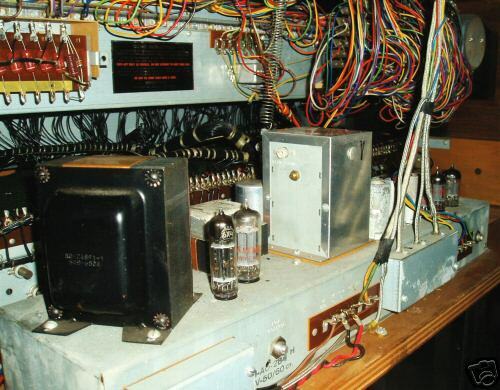 After his death, some others began to build organs like this, here is a picture of a 1930 magnetone. 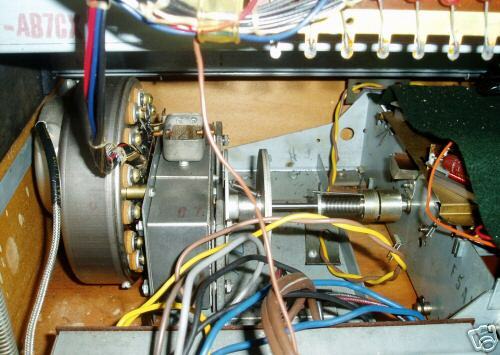 There is a whole battery of tone wheels in the Hammond organ, called the "tone generator". There is not one tone wheel for every key, there is one for every frequency, including the bass pedals. A musical instrument tone is build from it's generic frequency, all of it's harmonics and sub harmonics with the right amplitudes of course. Each key tone is composed in that way with one basic frequency, two sub harmonics (-2 and -3), the 2nd, 3rd, 4th 5th,7th and 8th harmonic. The odd harmonics have black slides, the even harmonics have white slides. The amplitudes are regulated with the slides you see on the organ desk. It's a bit of an art to get a particular tone, like for instance the mysterious Deep Purple "Smoke on the water" sound, or the seducing sound of Procul Harum's "Whiter shade of pale". The Santana sounds are made will all draw bars pulled fully out. That gives a heavy rock sound which you distort it by over driving the Leslie, or leading the organ output into a stack of guitar amplifiers. On the other hand, most combinations sound not bad anyway. Add to this the "click" noise which depends on how fast you press the keys. This is because each key has 12 contacts. This makes also the click sound different every time. Then the percussion harmonics are added, and there is your Hammond B3 key tone. 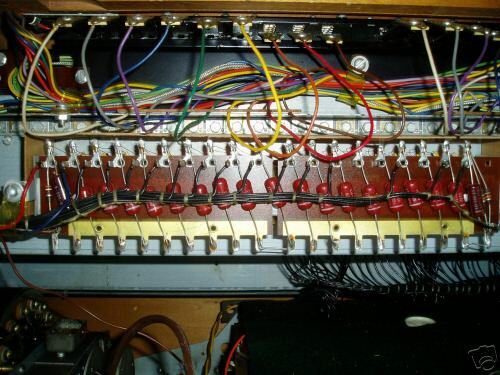 The organ uses a resistor network, wired from resistance wire, underneath the keyboard, adding up the harmonics in a different way for higher or lower tones. Quite scientific. That makes the Hammond "cry" at the higher end of the keyboard, mellow in the mid range, and the heavy bass at the low keys. The B3 is made with superb quality in mind. Anything that moves is made to last for ever. The slide contacts are made from Titanium, just to mention something, and the tone wheel generator is oiled by a spider network of several hundred cotton wires, which lead the oil to each single bearing, no matter how small or where it is, deep inside the organ. The vibrato scanner and the volume control are capacitive, so no contacts get bad. I love this piece of machinery, it's so well done. These are some pictures of a B3, same as the one I have. down the frequency a tiny bit, making the tone vibrate. gives the right sound expression because at lower volume it gains high frequency.